Who would have imagined that the delectable art of pairing fine wines and five-star cuisine would, eighteen years later, bring over fourteen million dollars to a worthy cause and increase the lifes- pan of those diagnosed with a terminal disease? It’s a wonder any one would ever say that one man or woman couldn’t make a difference. “This was an opportunity to see the fruits of our labor and the chance to really make a difference,” Barbara Balik, Director of Special Giving at Cystic Fibrosis Foundation, explains. She’s referring to one of the most prestigious events for chefs and winemakers in the country,“A Culinary Evening with the California Winemasters”. The event began eighteen years ago when Los Angeles residents Barbara and Allen Balik created a wine tasting and auction to benefit the Cystic Fibrosis Foundation’s research and care programs. At the time, there was only one major charity wine event existing in the country, the Napa Valley Wine Auction. Today, “A Culinary Evening with the California Winemasters” has evolved into one of the country’s largest single-day events and one of the top wine-related fundraisers. In 1995, “Winemasters” was invited to come to Paramount Pictures and use the famous “Streets of New York” back lot. With each successive year, the guest count and net proceeds have grown; the million-dollar mark was achieved in year seven and has continued climbing ever since. In 2006, “A Culinary Evening with the California Winemasters” raised $1,365,000 and hosted 1400 guests, 67 California wineries, and 35 chefs from around the country. Net proceeds raised over the last seventeen years now exceed $14,000,000. Neal Fraser’s Salmon Three Ways. Pat Hitchcock O’Connell, an ardent supporter of the foundation for many years, has also worked with Barbara on the local and national level. Pat’s oldest granddaughter, Melissa, had cystic fibrosis and her late father, the legendary Alfred Hitchcock, was an avid collector of Bordeaux and Burgundies. It was a perfect pairing and Pat agreed to serve as an event co- chair the first year, sticking with the position every year since. In fact, the entire Hitchcock family has been an integral part of the “Winemasters” success stor y since the beginning. When explaining the need to stay active in the event,Tere Carruba, grand-daughter of the late Hitchcock, gets to the roots of the meaning behind it. “When we began the event, the life expectancy of a child with CF was ten; today it is 37,” Barbara Balik explains. “More importantly, we are at the point where we are adding one year of life for every year of research. We know we have played a role in adding to the success story of the Cystic Fibrosis Foundation. It’s truly an amazing feeling that is difficult to convey. With noble intentions and charity comes formidable talent. With talent, follows passion. With passion, persimmons. Well, persimmons when you’re talking about Josiah Citrin’s Ahi Tuna Tartare and Persimmon Tomato Yuzu Condiment with Shiso Salt. 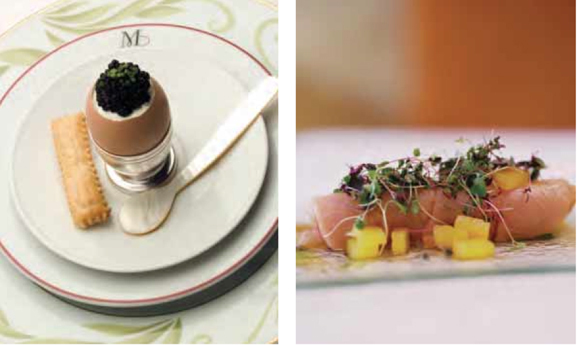 A key chef in the “Winemasters” event, Citrin knows haute cuisine. High- art victuals aside, he cites a well-grown tomato as one of his favorite ingredients to get creative with. A self-taught culinary expert and veteran of Los Angeles’ gourmet din- ing scene, Citrin is chef and co-owner of the highly respected Mélisse Restaurant in Santa Monica and co-owner of Lemon Moon Café in West Los Angeles. After forming the basis of his chef’s training abroad, he returned to the U.S. and began his career at locales like L.A.’s Chinois on Main, Patina and Pinot Bistro, cooking alongside famed chef and restaurateur Joachim Splichal. Citrin’s service to the community allows him to mentor the careers of younger chefs whom he has hand-selected and trained. He has established a long-standing rapport with various farmers from Los Angeles and hosts a bi- annual dinner at his restaurant in their honor. He also works with numerous other charitable causes, including the Wolfgang Puck Cancer Society Event, Planned Parenthood, Special Olympics and Cure Autism Now. “I made a decision to do whatever it takes to make time for charitable causes and, with that decision, I am forced to cre- ate time. I’m in a position where I can give a lot and raise money. I believe if one has that ability one should use it to better the world we live in,” Citrin explains. Game it is for Neal Fraser, owner of the popular Los Angeles eatery Grace, whose specialties revolve around rich meats like boar and rabbit. Grilled tenderloin of wild boar is married with roasted brussels sprouts, herbedYukon gold potato spaetzle and violet mustard sauce, while braised pork shank rests alongside with garlic rapini, smoked shallot, chorizo home fries and cider sage sauce. Fraser began his culinary career in L.A. at the tender age of 20, working as a line cook at Eureka Brewery and Restaurant, one of Wolfgang Puck’s earliest ventures. Inspired, Fraser soon entered the Culinary Institute of America in New York and worked with such luminaries asThomas Keller at the Checkers Hotel in Los Angeles and David Burke at the Park Avenue Cafe. Aside from the dazzling art of cultivating fine fare, Fraser adds the more poignant touch of philanthropy. 2007 “Winemasters” Culinary Chairman Celestino Drago grew up in Galati, Sicily; his childhood there might have set the stage for an early appre- ciation for homemade Italian foods, but his life in Los Angeles has been the place where he’s made himself a home and cultivated his skills. He learned the art of preparing homemade wine, cheese, and olive oil from his father. Meals around the family’s hearth included his mother’s fresh baked breads and homemade pasta; Celestino and his brothers were responsible for everything from pulling the wheat for pasta to picking the grapes for wine, and milking the cows for cheese. At the age of 15, Celestino moved to Pisa to study engineering. To earn spending money, he began working at Chef Ignazio Diana’s Pierino Ristorante in Tuscany. Celestino moved to Los Angeles in 1979 and, after work- ing as chef at various successful restaurants, Drago opened Il Panino at MOCA in 1984. In 1991, Drago Ristorante was born. A haven for fine regional Italian cuisine, Drago remains an integral part of Los Angeles’ dining culture and consistently ranks on numerous “best-of” lists. The Success of Drago Ristorante allowed Celestino and his brothers to open Il Pastaio, Celestino Ristorante, Celestino Italian Steakhouse, and Enoteca Drago. Sharing a common interest in wine and agriculture, Paul and Suzie Frank decid- ed to quit their careers (as a marketing executive and school teacher, respectively) in order to pursue the proverbial dream of building a wine business.The fruits of their labor became GemstoneVineyard; today,they are the Honorary Wine Chairmen of the “Winemasters” event. Before coming on as sponsors of “Winemasters”, the Franks were impressed with the efficient operational elements that keep expenses among the lowest of comparable charitable events, thus allowing Cystic Fibrosis research to directly benefit from virtually all of the considerable proceeds. But they also felt that combining beautiful wines with great cuisine and fun friends to raise funds for a compelling cause was a winning combination for everyone. Image courtesy Neal Fraser/Grace Restaurant.